Most people mistakenly believe that harmful pollution is only in the air we breathe outside when in fact, indoor air tends to be harder on your lungs. Air indoors contains the same contaminants as air outdoors, but can be composed of more allergens, pathogens, and toxins than even a smoggy day outside. 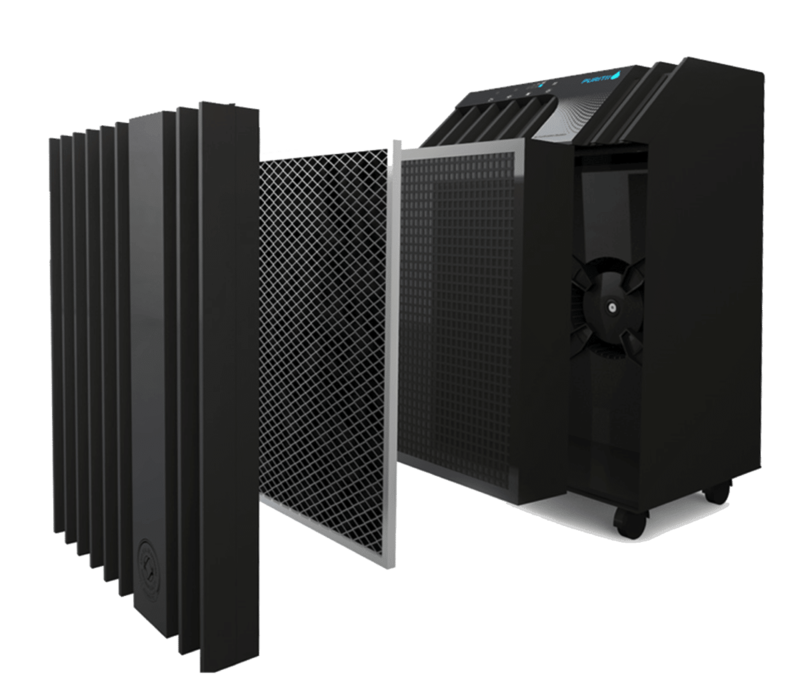 The high-capacity, 11-stage Puritii Air Purification System removes 99.99% of particulates 2.5 microns is size, microbes, and dangerous gases from your home and office. * With our industry-leading lifetime warranty, you can rest assured knowing that your home is protected from silent, invisible toxins. 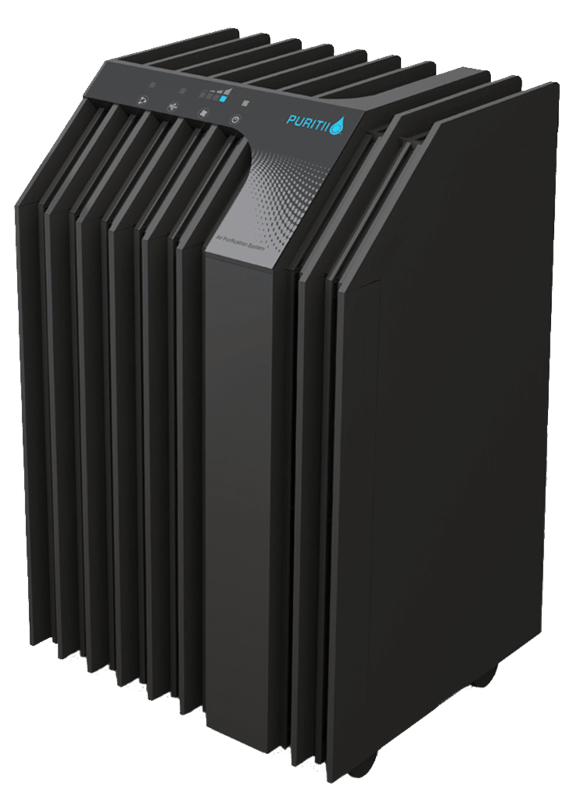 Puritii is the only air purification system like it on the market today, with an intensive 11-step purification process. In the Pre-Filter, stages 1-3, Puritii captures larger particles like dust and lint--common culprits of allergies, lung issues, and other health problems. In the Main Filter, stages 4-10, is when up to 99.99% of bacteria, viruses, and mold are filtered through a blend of minerals. * Finally, in Stage 11, an ionizing needle charges the air with negative ions and eliminated offensive odors. » Particulates down to 3 microns, including pollen, dust and dust mite residue, pet dander, etc. » Volatile organic compounds (VOCs) from smoke, odors, exhausts, fumes, chemicals, etc. 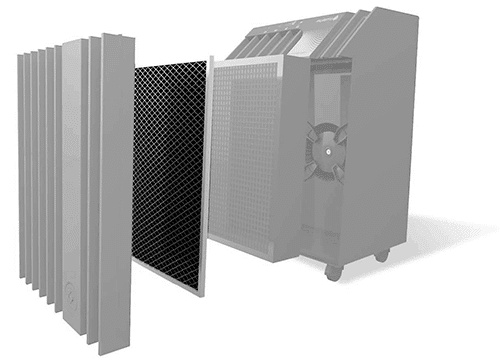 » » Stage 1: PolyMesh Pre-Filter— This filter statically attracts larger particles of dust, dander, hair and lint. » » Stage 2: MacroX-15 Pre-Filter— This filter captures smaller particles, such as finer dust and lint, down to 15 microns in size (a human hair is 30–70 microns in diameter). » » Stage 3: MacroX-10 Pre-Filter— This filter captures particles 10–15 microns in size, such as mold and mildew spores and dust mite residue, which circulate in even the cleanest homes. The 7-stage main filter assembly captures dangerous airborne particulates that are notorious for causing lung damage, from 10 microns all the way down to .3 microns in size. It also absorbs volatile organic compounds (VOCs) such as petrochemical fumes, ammonia, formaldehyde and many others. 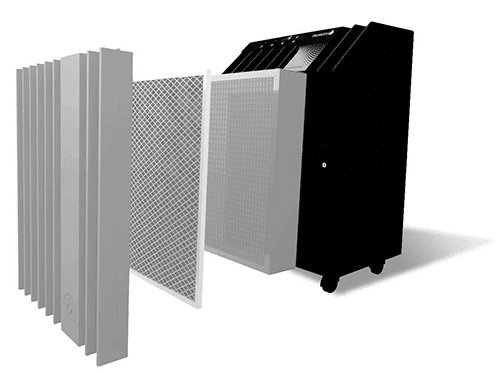 » » Stage 4: MacroX-10 Pre-HEPA Filter— The Pre-HEPA filter captures particulates 10 microns and larger missed in the pre-filtering stages. » » Stage 5: HEPA-Type Filter— Millions of sub-micron pores in this hardworking filter capture 100% of particulates 2.5 microns and larger, and over 99% of pollutants .3 microns or larger, including airborne bacteria and viruses. » » Stage 6: Pre-VOC Diffuser— The VOC stages of filtration are particularly important for those with odor sensitivities and chemical allergies. This first layer is honeycombed to evenly diffuse air through the stages that follow. » » Stage 7: Activated Carbon— High-capacity carbonized pellets act like sponges to absorb a wide range of gases, chemicals and fumes, including residues of solvents, petrochemical products and odors. » » Stage 8: Zeolite— The unique molecular structure of granulated zeolite, a porous volcanic rock, absorbs gaseous pollutants such as hydrogen sulfide, sulfur dioxide, benzene and formaldehyde. » » Stage 9: Potassium Permanganate— Potassium Permanganate is an oxidizing agent that removes additional odors and harmful gases such as ammonia. 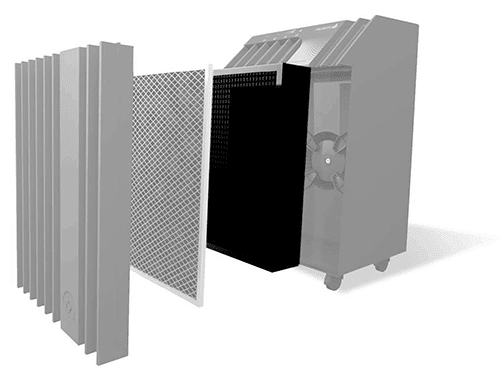 » » Stage 10: Post-VOC Diffuser— This filtering layer delivers air from the VOC filter into the ionizing chamber. »» The chamber in this phase of filtration contains an ionizing needle that delivers a mild static charge, energizing passing air molecules like a mini thunderstorm and leaving a fresh, clean fragrance. »» Activates with the push of a button for use whenever needed.